CSIR – Central Food Technological Research Institute, Mysuru a constituent national laboratory of Council of Scientific & Industrial Research(CSIR), invites applications from eligible candidates for recruitment of 1 (One) position of Project Assistant Level-II, initially for a period of five months or till the project is over on a temporary contractual basis in the project entitled “Development of Nutraceutical food products by incorporating nanoencapsulated curcumin & study of its anti-inflammatory activity” (GAP-0538) funded by SERB, tenable at the Department of Spices and Flavour Sciences, CSIR-CFTRI, Mysore, Karnataka. Essential Qualifications: First class M.Sc. in Biotechnology/Biochemistry/Microbiology/Food Science & Technology & other Life Sciences with good academic records. 1. Candidates should not have exceeded 30 years of age as on 07.02.2019 i.e. the last date of receiving the applications. Age relaxation as applicable by Govt. of India rules for SC/ST/OBC and women candidates will be considered. 3. The engagement will be contractual and on purely temporary basis in the externally funded project (GAP-0538) for a maximum period of five months and is co-terminus with the project, if the project terminates earlier or till the funds are available, whichever is earlier. 7. If already the candidate is working in CSIR-CFTRI “No objection certificate” from the PI is mandatory at the time of interview. 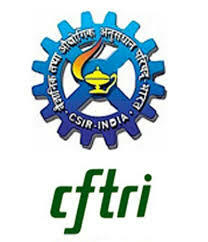 Eligible candidates may send their complete Bio-data with e-mail address/contact phone number along with attested copies of the necessary certificates in support of date of birth, caste, qualification/experience etc., as soft copy to Dr. Pooja J A Rao, Junior Scientist, Department of Spices and Flavour Sciences, CSIR-CFTRI Mysuru–570020, Karnataka (Email: poojarao@cftri.res.in) on or before 07.02.2019. Application format can be downloaded from the website www.cftri.com Applications received after the due date (07.02.2019) will be rejected. The short-listed candidates will be informed about the date of interview and the venue through e-mail/post. Applications incomplete in any of the above respects or lacking relevant documents mentioned above are liable to be rejected.